This article on economics in science fiction & fantasy is part of the Science in Sci-fi, Fact in Fantasy blog series. Each week, we tackle one of the scientific or technological concepts pervasive in sci-fi (space travel, genetic engineering, artificial intelligence, etc.) with input from an expert. Please join the mailing list to be notified every time new content is posted. Candida Spillard obtained her PhD in “Transhorizon Microwave Propagation and its Relationship with Meteorological Conditions” before going on to two decades of research in the field, including pulling together work from all over Europe, part of which re-wrote the standards for radiocommunications from Unmanned Aerial Vehicles. As a result of this international mingling she can order drinks and say “Cheers” in ten languages. She has been known to explain Bessel functions by sliding a glass of beer across a table. She’s also the author of the surreal fantasy The Price of Time. You should follow her on Twitter. How far can a radio signal travel? What might your newly-landed-upon planet’s atmosphere and landscape do to it and, perhaps most important, will wearing a tinfoil hat prevent it from disrupting your brain? Find, or imagine, a quiet pond, its surface clear of obstacles. Now lob in a stone and watch what happens. The circle of disruption expands across the surface, with the height of the waves decreasing as they spread. Radio waves, and all electromagnetic waves including the light waves we can see, spread through a vacuum in much the same way, only instead of sending out energy in the form of alternating height and pressure they do so with alternating electric and magnetic fields. And they do so as spheres rather than circles. The catch-all term ‘radio’ includes waves of a huge range of wavelengths: from under 1 mm (frequency of 300 GHz or 3 * 1011 cycles per second), to the so-called ‘High Frequency’ used by radio amateurs, of lengths over 10 metres (frequency of 30 MHz or 3 * 107 cycles per second). Mobile phone networks use bands ranging from 2.6 GHz down to 0.8 GHz: wavelengths of – in old money – a few inches up to just over a foot. The eagle-eyed may have spotted that multiplying the wavelength and the frequency together will always give 3 * 108: the speed of light (in metres per second), at which they all travel. 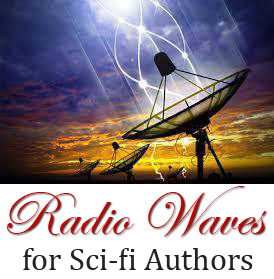 Radio waves cannot travel through anything – from your steel-lined bunker to layers in the ionosphere – that conducts electricity. They will instead reflect from the surface, as light at a mirror. Radio waves can, however, travel through the walls of ordinary buildings, which are in general non-conducting – or ‘dielectric’ – materials (not to be confused with Dialectical Materialism…). As the area of these spheres’ surfaces rises with the square of distance from the wave source (good old 4 π r2), so the energy picked up by a given receiver will fall with the square of distance. Trebling the distance will reduce your received energy nine-fold. At the receiving end, picking up a radio signal could be compared to flattening an umbrella to catch the rain. The haul of ‘pennies from heaven’ will be in direct proportion to the area of brolly: trebling the length of the struts will increase your loot nine-fold. A parabolic (the type of curve traced out by plotting y = x2) metal dish will reflect waves diverging from a point source at its ‘focus’ and form them into a near-parallel beam. Conversely, like a satellite dish on a roof, it will also direct incoming parallel waves to its focus. Thus, a large dish may pick up a faint signal, but only from within a narrow arc in one specific direction. The angular width of this arc, in radians and for an ‘ideal’ antenna, is twice the wavelength divided by the dish’s diameter. One radian is 180/π degrees. The ‘gain’, or factor by which the signal is enhanced in this direction, is inversely proportional to the square of this width. For portable communicators – such as mobile phones or the communicators used in Star Trek – use of this feature is obviously impractical. So: you’ve landed on a new planet, you’ve set up Base, and your intrepid explorers are off looking for alien life, but without losing touch with you. The strongest signals will be obtained within line-of-sight, but further propagation is also possible. The atmosphere’s radio refractive index is frequency-dependent, but for all frequencies it decreases with height, as the atmosphere thins. Through the troposphere (the atmosphere’s lowest layer, where all the weather happens: about the first 10 km of height) the temperature also decreases. This bends radio waves beyond the visible horizon. For centimetre wavelengths transmitted horizontally this has the effect of increasing the earth’s radius by some 30%. A denser atmosphere will result in a more dramatic increase. Beyond this distance, in turbulent conditions a faint (some 60 dB, or 106 times, down from line-of-sight) centimtre-wave signal can be picked up from atmospheric scattering. Rain in the volume ‘seen’ by both ends of a link will scatter a millimetre-wave signal enabling reception beyond line-of-sight. In both these reception regimes, just as in radar engineering, received energy falls with the fourth power of distance – doubling the distance reduces the signal sixteenfold. In stable conditions, familiar to us as the calm weather that accompanies an area of high pressure, the atmosphere settles into layers or ‘feuillets’. Multiple partial reflections occur from these, which can give signals beyond the horizon almost as strong as if they were line-of-sight. Deep fades in signal strength, lasting several seconds, occur when movement of the layers results in reflected waves arriving at the receive point in antiphase, effectively cancelling each other out. HF waves can propagate far beyond the horizon if conditions in the Ionosphere allow for reflections, for example if the upper atmosphere is being bombarded with a solar ejection. This effectively turns the lowest 300 km of the atmosphere into a giant waveguide. These received signals, like the microwaves reflected in the lower atmosphere, are subject to slow deep fades as layers move. Ionospheres have been found on Venus, Mars, Jupiter and Uranus, and by absorbing cosmic rays (which are in fact high-energy atomic nuclei and not radiation at all) they are a pre-requisite for life as we know it. Waves are most affected by objects of similar size to their wavelength. Raindrops scatter and absorb millimetre waves, causing signal fading – a tropical storm can temporarily wipe out a link. Eddies of turbulence in the atmosphere scatter centimetre and decimetre waves; they do not cause dramatic fading but can result in faint signals being picked-up unexpectedly in other locations. The longer waves – anything over half a metre – will diffract round the corners of large rocks or buildings. Sandstorms will absorb most of the higher end of the radio spectrum, causing loss of signal but no scattering. Buildings and cityscapes also offer challenges, particularly if they contain metal beams, struts, reinforcing mesh or metallic tinted windows. An office block with a lattice of steel beams, reinforced concrete or even the steel ‘formers’ used by plasterers to neaten the corners of rooms, will break up an incoming mobile phone signal. Each gap between struts will serve as the source of a new wave, the circular fringes of which will spread – diffract – across the floor-plan just like the waves in our pond. At places where these waves arrive in antiphase, there will be a null in reception. If the steel pieces are spaced closely enough – within a matter of a few wavelengths – then signal will only be available at locations near the walls, and not deep into the room. This also explains mobile phone reception on the inside of a (metal) vehicle: the waves diffract in through the windows. And so, to answer our final question: a tinfoil hat will not stop those pesky waves from reaching your brain. They will simply diffract around it!